This section covers topics which are developer specific and which have not been covered in the user guide. Please see the OpenFlow plugin user guide first. It can be found on the OpenDaylight software download page. The OpenFlow Protocol Library provides interface SwitchConnectionHandler which contains method onSwitchConnected (step 1). This event is raised in the OpenFlow Protocol Library when an OpenFlow device connects to OpenDaylight and caught in the ConnectionManagerImpl class in the OpenFlow plugin. There the plugin creates a new instance of the ConnectionContextImpl class (step 1.1) and also instances of HandshakeManagerImpl (which uses HandshakeListenerImpl) and ConnectionReadyListenerImpl. ConnectionReadyListenerImpl contains method onConnectionReady() which is called when connection is prepared. This method starts the handshake with the OpenFlow device (switch) from the OpenFlow plugin side. Then handshake can be also started from device side. In this case method shake() from HandshakeManagerImpl is called (steps 1.1.1 and 2). The handshake consists of an exchange of HELLO messages in addition to an exchange of device features (steps 2.1. and 3). The handshake is completed by HandshakeManagerImpl. After receiving device features, the HandshakeListenerImpl is notifed via the onHanshakeSuccessfull() method. After this, the device features, node id and connection state are stored in a ConnectionContext and the method deviceConnected() of DeviceManagerImpl is called. When the OpenFlow device responds to these requests (step 4.2.1.1) with multipart replies (step 5) they are processed and stored to MD-SAL operational datastore. The createDeviceFeaturesForOF<version>() method returns a Future which is processed in the callback (step 5.1) (part of initializeDeviceContext() in the deviceConnected() method) by calling the method onDeviceCtxLevelUp() from StatisticsManager (step 5.1.1). The call to createDeviceFeaturesForOF<version>(): . creates a new instance of StatisticsContextImpl (step 5.1.1.1). The first thing that happens when an OpenFlow device connects to OpenDaylight is that the OpenFlow plugin gathers basic information about the device and establishes agreement on key facts like the version of OpenFlow which will be used. This process is called the handshake. After selecting of version we can say that the VERSION IS SETTLED and the OpenFlow plugin can ask device for its features. At this point handshake ends. There are two ways to add a flow in in the OpenFlow plugin: adding it to the MD-SAL config datastore or calling an RPC. Both of these can either be done using the native MD-SAL interfaces or using RESTCONF. This discussion focuses on calling the RPC. If user send flow via REST interface (step 1) it will cause that invokeRpc() is called on RpcBroker. The RpcBroker then looks for an appropriate implementation of the interface. 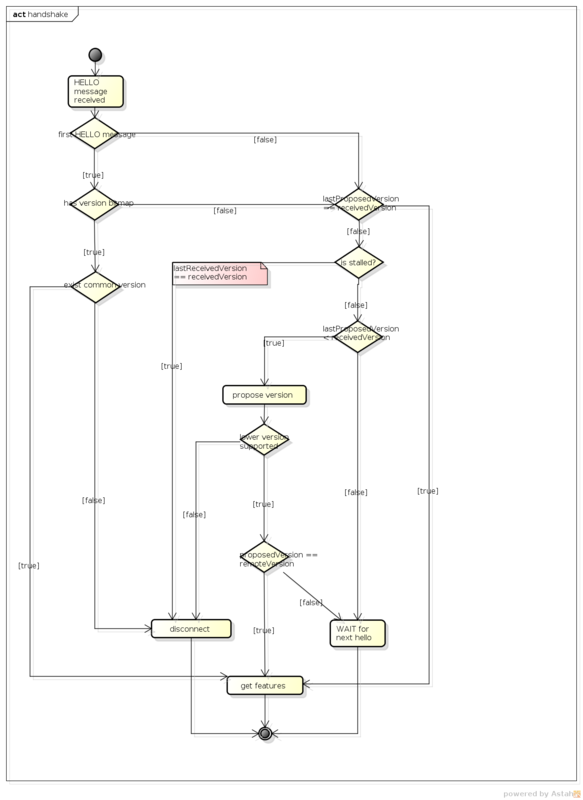 In the case of the OpenFlow plugin, this is the addFlow() method of SalFlowServiceImpl (step 1.1). The same thing happens if the RPC is called directly from the native MD-SAL interfaces. The callback method is triggered when a barrier reply message (step 2.1) is received from the device indicating that the flow was either installed or an appropriate error message was sent. If the flow was successfully sent to the device, the RPC result is set to success (step 5). // SalFlowService contains inside method addFlow() other callback which caught notification from callback for barrier message. At this point, no information pertaining to the flow has been added to the MD-SAL operational datastore. That is accomplished by the periodic gathering of statistics from OpenFlow devices. The StatisticsContext for each given OpenFlow device periodically polls it using gatherStatistics() of StatisticsGatheringUtil which issues an OpenFlow OFPT_MULTIPART_REQUEST - OFPMP_FLOW. The response to this request (step 7) is processed in StatisticsGatheringUtil class where flow data is written to the MD-SAL operational datastore via the writeToTransaction() method of DeviceContext. The OpenFlow plugin project contains a variety of OpenDaylight modules, which are loaded using the configuration subsystem. This section describes the YANG files used to model each module. 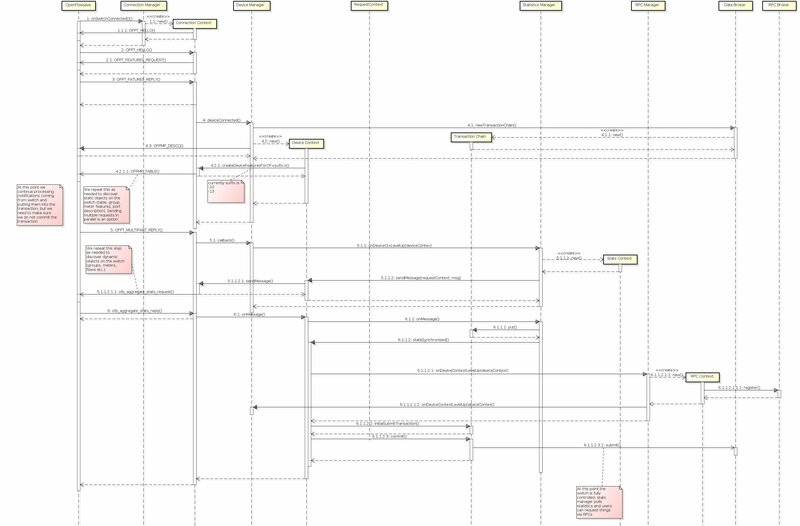 General model (interfaces) - openflow-plugin-cfg.yang. In order to provide multiple instances of modules from openflowjava there is an API change. Previously OFPlugin got access to SwitchConnectionProvider exposed by OFJava and injected collection of configurations so that for each configuration new instance of tcp listening server was created. Now those configurations are provided by configSubsystem and configured modules (wrapping the original SwitchConnectionProvider) are injected into OFPlugin (wrapping SwitchConnectionHandler). Here the whole configuration is contained in one file (controller.xml). Required entries needed in order to startup and wire OEPlugin + OFJava are simply added there. Here new config file has been added (src/main/resources/configuration/initial/42-openflow-protocol-impl.xml) and is being copied to config/initial subfolder of build. In order to push the actual config into config/initial subfolder of distributions/base in integration project there was a new artifact in OFPlugin created - openflowplugin-controller-config, containing only the config xml file under src/main/resources. Another change was committed into integration project. During build this config xml is being extracted and copied to the final folder in order to be accessible during controller run. To aid in testing and diagnosis, the OpenFlow plugin provides information about the number and rate of different internal events. The implementation does two things: collects event counts and exposes counts. Event counts are grouped by message type, e.g., PacketInMessage, and checkpoint, e.g., TO_SWITCH_ENQUEUED_SUCCESS. Once gathered, the results are logged as well as being exposed using OSGi command line (deprecated) and JMX. When a message passes through any of those checkpoints then counter assigned to corresponding checkpoint and message is incremented by 1. Forwarding Rules Synchronizer (FRS) is a newer version of Forwarding Rules Manager (FRM). It was created to solve most shortcomings of FRM. FRS solving errors with retry mechanism. Sending barrier if needed. Using one service for flows, groups and meters. And it has less changes requests send to device since calculating difference and using compression queue. In the old FRM uses an incremental strategy with all changes made one by one, where FRS uses a flat batch system with changes made in bulk. It uses one service SalFlatBatchService instead of three (flow, group, meter). FRS is used in Boron as separate feature and it is not loaded by any other feature. It has to be run separately. SalFlatBatchService was created along forwardingrules-sync application as the service that should application used by default. This service uses only one input with bag of flow/group/meter objects and their common add/update/remove action. So you practically send only one input (of specific bags) to this service. There is flag in ProcessFlatBatchInput to stop process on the first error. If error occurs in any of partial steps upper FlatBatchService call will return as unsuccessful in both cases. However every partial error is attached to general flat batch result along with BatchFailure (contains BatchOrder and BatchItemIdChoice to identify failed step). The existing OpenDaylight service deployment model assumes symmetric clusters, where all services are activated on all nodes in the cluster. However, many services require that there is a single active service instance per cluster. We call such services singleton services. The Entity Ownership Service (EOS) represents the base Leadership choice for one Entity instance. Every Cluster Singleton service type must have its own Entity and every Cluster Singleton service instance must have its own Entity Candidate. Every registered Entity Candidate should be notified about its actual role. All this “work” is done by MD-SAL so the Openflowplugin need “only” to register as service in SingletonClusteringServiceProvider given by MD-SAL. In this new clustering singleton approach plugin uses API from the MD-SAL project: SingletonClusteringService which comes with three methods. This service has to be registered to a SingletonClusteringServiceProvider from MD-SAL which take care if mastership is changed in cluster environment. Services are managed by SinlgetonClusteringServiceProvider from MD-SAL project. So in startup we simply create a instance of LifecycleService and register all contexts into it. Plugin is no longer registered as Entity Ownership Service (EOS) listener therefore does not need to and cannot respond on EOS ownership changes. If closeServiceInstance occurred plugin just simply try to store all unsubmitted transactions and close the transaction chain manager, stop RPC services, stop Statistics gathering and after that all unregister txEntity from EOS. Short HOWTO create such a tree. We need to translate OpenFlow messages coming up from the OpenFlow Protocol Library into MD-SAL Notification objects and then publish them to the MD-SAL. You can see an example in PacketInTranslator.java. Notice that there is a separate registration for each of OpenFlow 1.0 and OpenFlow 1.3. Basically, you indicate the type of OpenFlow Protocol Library message you wish to translate for, the OpenFlow version, and an instance of your Translator. That’s all there is to it. Now when a message comes up from the OpenFlow Protocol Library, it will be translated and published to the MD-SAL. While the Helium release of OpenFlow Plugin relied on queues to ensure messages were delivered in order, subsequent releases instead ensure that all the messages from a given device are delivered using the same thread and thus message order is guaranteed without queues. The OpenFlow plugin allocates a number of threads equal to twice the number of processor cores on machine it is run, e.g., 8 threads if the machine has 4 cores. While each device is assigned to one thread, multiple devices can be assigned to the same thread.